Keeping you up to date on the latest mens fashion is Apache Online, UK and today we focus on sublimation printed t-shirts by the contemporary menswear label, Duck and Cover. Duck and Cover Clothing will have you on trend and looking sharp as the men’s clothing range features unique basics with a modern twist. We have in stock and on sale, their printed graphic tees, which offer that signature hint of wartime style mixed with contemporary cool. 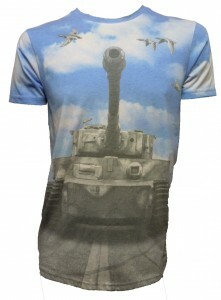 Channelling the American military wartime vibe is this soft cotton Costello Sublimation Print T Shirt. 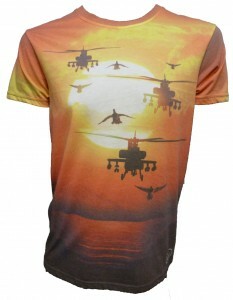 This t shirt presents a helicopter squadron against a fashionably flamboyant sunset print. The t shirt’s design has been heat transferred using the sublimation print technique, so if you’re looking for a bright and colourful way to update your daily wardrobe then look no further than this highly detailed semi-slim fit t-shirt. 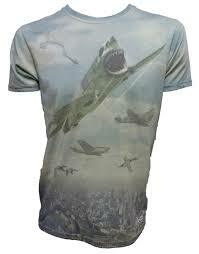 Become a fashion maverick with the new Stannis Sublimation Print T Shirt, a sharp and detailed shark plane print over a city landscape. The high temperature sublimation printing process allows for this unique fully printed image on the front, back and sleeves, giving a bigger design and bolder statement. Or, check out this superior menswear Portman Print T Shirt, once again by Duck and Cover Clothing. You’ll be sure to turn heads when decked out in this eye-popping and elaborate all-over army tank print. Get the full look and match it with a pair of Duck and Cover jeans. Each of the discounted Duck and Cover sublimation print t shirts are crafted from pure cotton and feature the brand’s iconic flying ducks. They all come with a small branded badge to the back of the neck and a small Duck and Cover logo printed at the bottom. Get the look and shop our Duck and Cover menswear collection at our UK online store; The premium brand that will have you “ready for anything”!